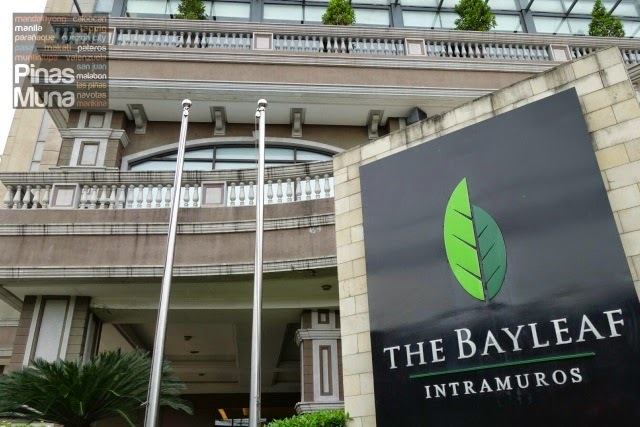 The Bayleaf Intramuros is a 57-room first class hotel located within the historic walled city of Intramuros in Manila, Philippines. 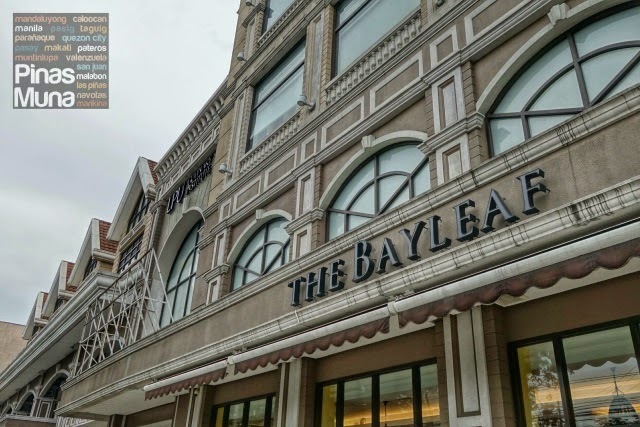 For two consecutive years (2013-2014) The Bayleaf Intramuros was also awarded by TripAdvisor with the coveted Travelers’ Choice Award and the prestigious Certificate of Excellence, placing the hotel in the top-performing 10% of all listed businesses worldwide. 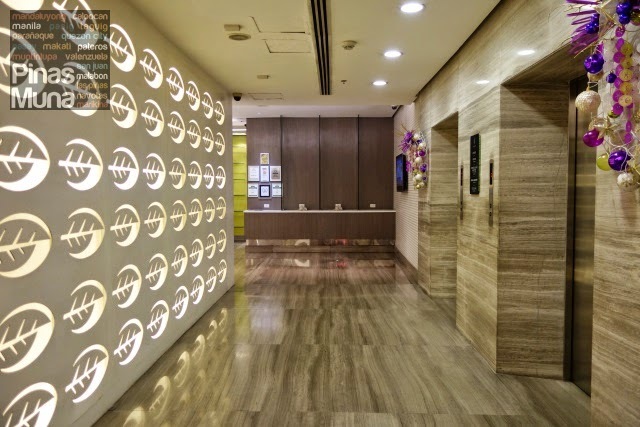 The hotel's carefully designed exterior gives it touches of both modern and classic architectural features. 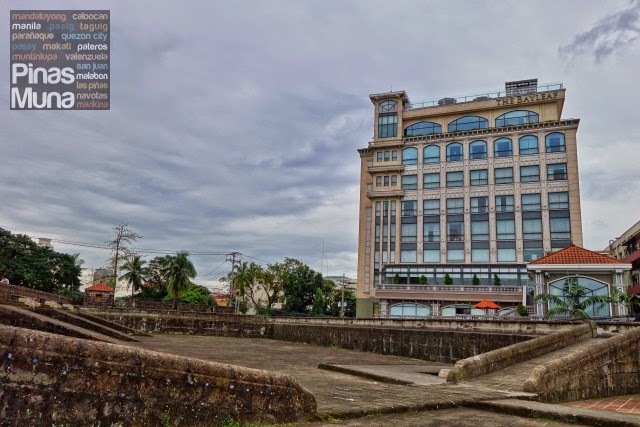 This allows the hotel to perfectly blend with the old structures inside Intramuros, preserving the colonial Manila charm of its immediate surrounding. Cioccolata Churros Café, located at the ground floor of the hotel, adds more European flair to the street. The cafe specializes in churros, a classic Spanish favorite snack, and freshly baked breads and pastries. 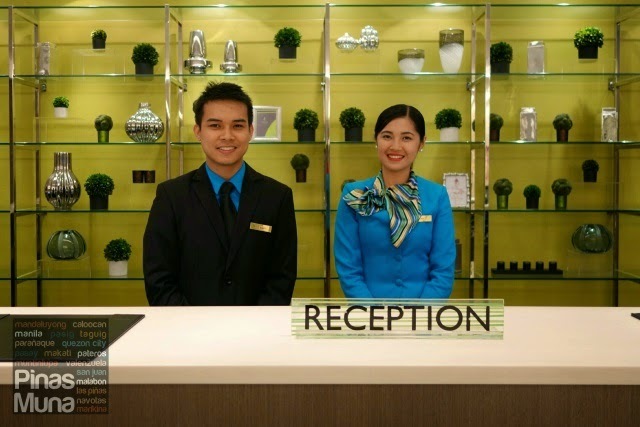 At the hotel's reception, you will be welcomed by Bayleaf's very well trained frontdesk officers who will ensure that your check-in will be as swift and convenient as possible. 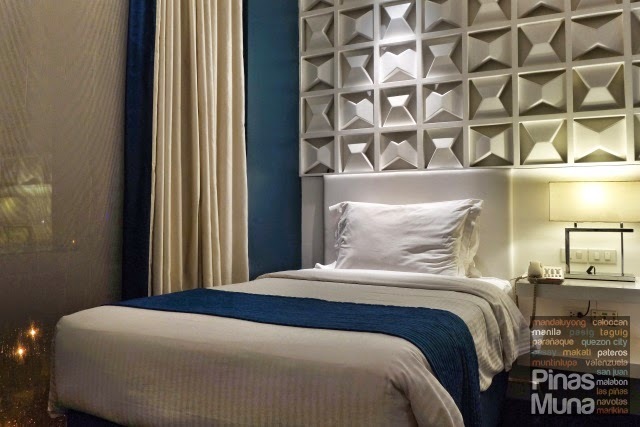 The hotel requires a minimal, refundable incidental deposit of only P500.00 per day, alternatively you can also provide them with your credit card details at no extra charge. We were provided with two electronic key cards. These cards restrict your elevator access only to the floor where your assigned room is located. This key card also serves as the key to your room. 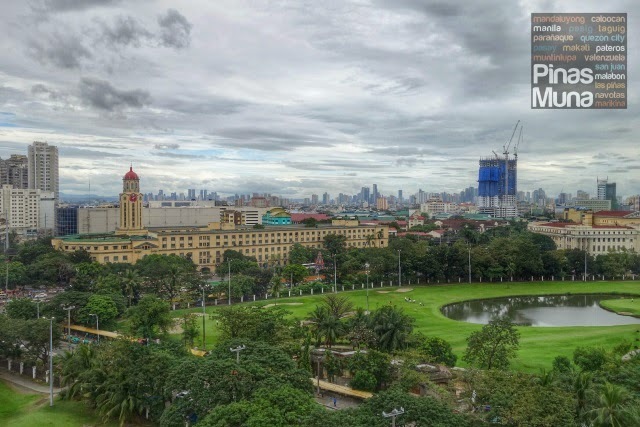 We stayed in a Superior Room on the east side of the hotel facing the Manila City Hall. The A/C was already on when we entered the room so we were able to immediately settle down and recover from our long road travel from Pasig City to Intramuros. 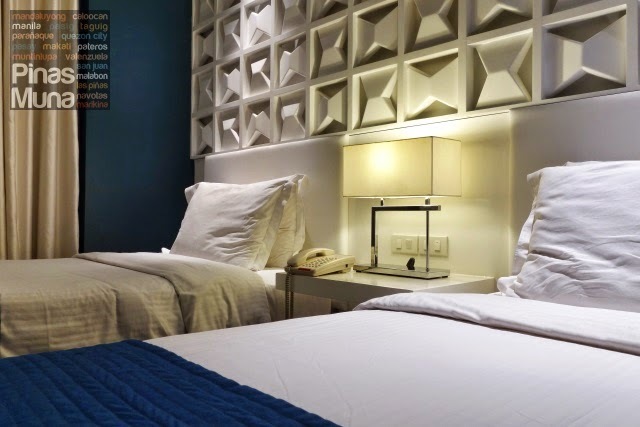 Superior Rooms measure 23sqm and are available in two bed configurations: Superior Queen and Superior Twin. There are four color themes guests can choose from: lime, aubergine, orange and teal. You can request your preferred color theme, and the hotel will gladly accommodate your request depending on the availability. 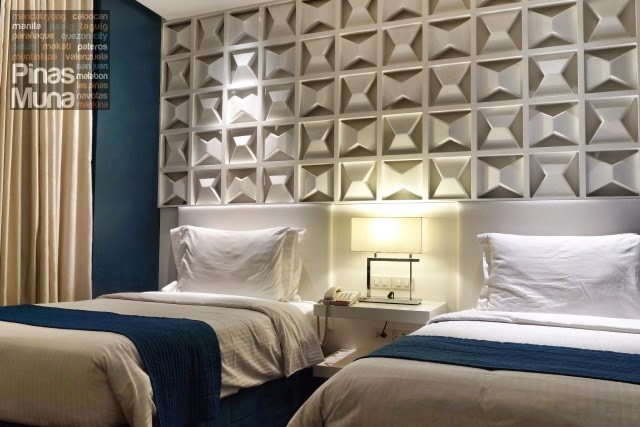 We stayed in a teal color themed room which has a calming and uplifting effect to the mood. The mattress has the right firmness and is very comfortable to the back. The pillows are fluffy soft but firm enough to support the neck. The pillow covers, linens and the duvet are clean and smelling fresh. Bedside switches control the overhead lamps allowing the guests to conveniently set the lighting mood inside the room. 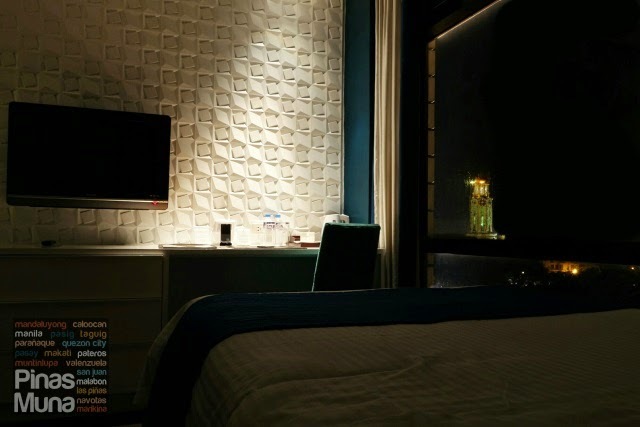 The room is equipped with a 32" multimedia LCD cable TV mounted on the wall facing the bed. 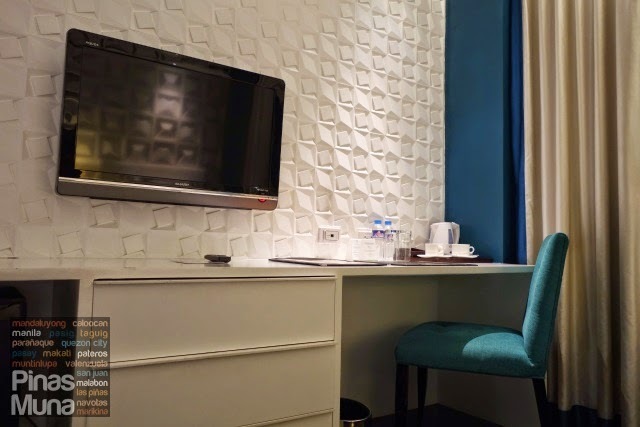 Beside the TV is a spacious work station where guests can work with their laptops and connect to the Internet via the room's complimentary WiFi access. 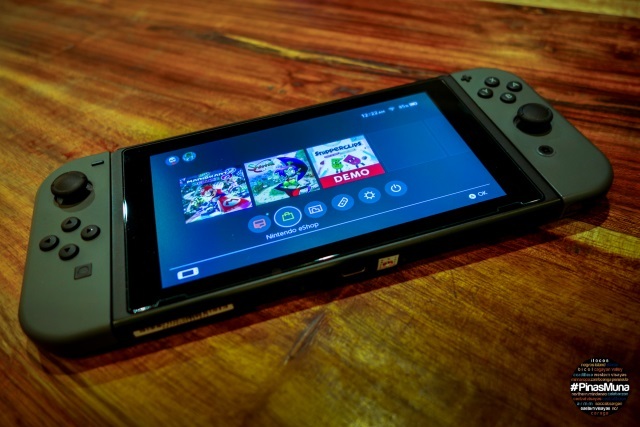 Other room amenities include individual room temperature control, coffee & tea making facility, in-room safety deposit box, a mini bar, and an electronic DND (do not disturb) & make-up rooms buttons. 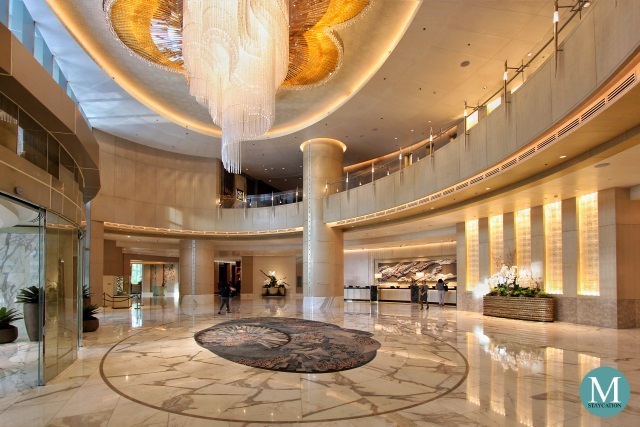 Two complimentary bottled mineral water is also provided daily per room. Bathrobe & slippers are available upon request. 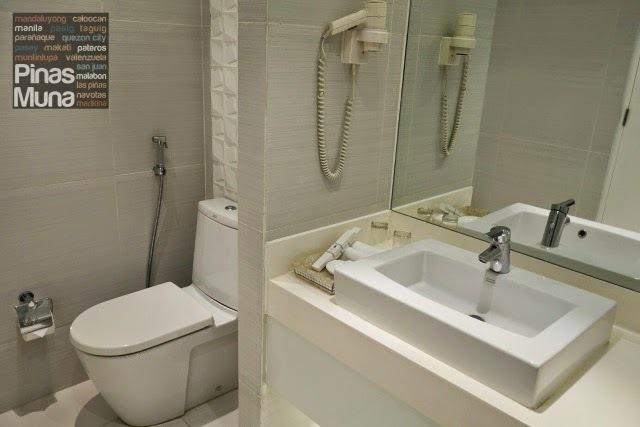 The en-suite bathroom is clean and looks well maintained. The white tiles and marbles do not show any mark of stain or mold. The toilet is equipped with a bidet. The sink has hot and cold water with terrific water pressure. Two clean glasses, disposable toothbrushes and toothpaste are also provided. A hair dryer is also mounted beside the mirror. 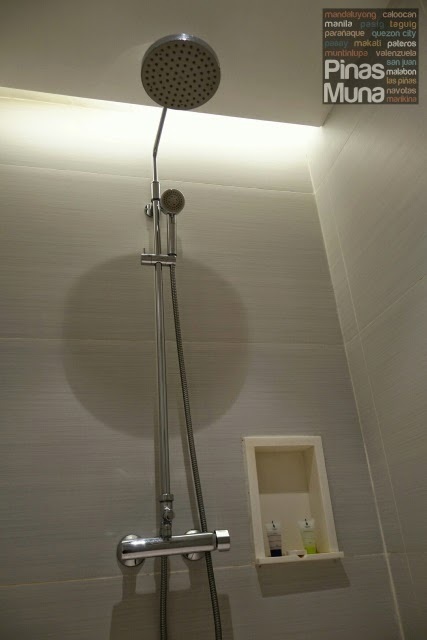 The walk-in shower features a rain shower with an attached hand shower. The hot and cold shower is easy to control and the water pressure is excellent. Complimentary shampoo, conditioner and body soap are also provided. The towels smelled clean and fresh. 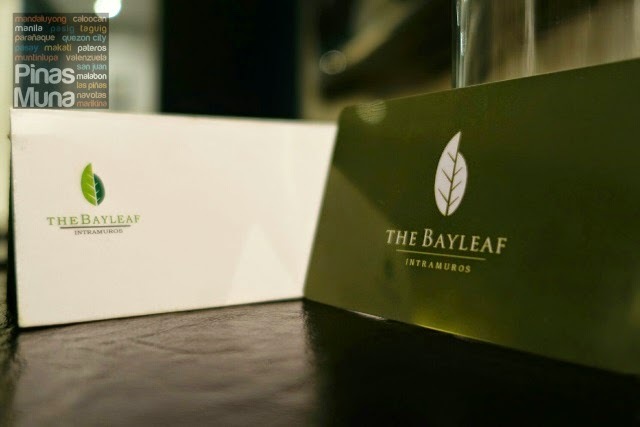 Later that evening, we got to try Bayleaf's newest restaurant. Raffaele Woodfired Pizza, located on the third floor of the hotel, specializes is Italian style pizza cooked in a woodfired oven imported from Italy. 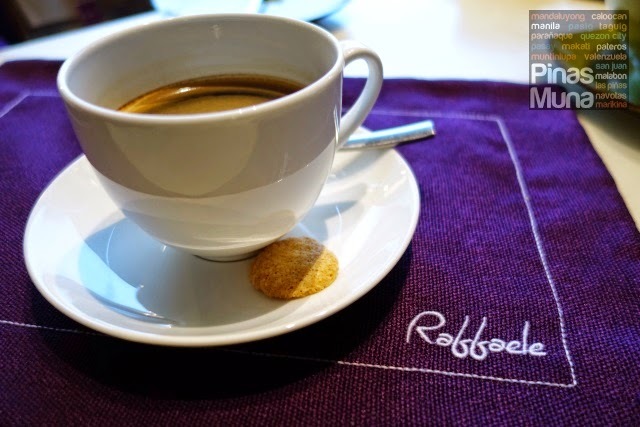 More than just a pizzeria, Raffaele is a casual dining restaurant serving other classic Italian dishes such as pasta, salads, risotto, a variety of mains and desserts, and of course, coffee. TRIVIA: The restaurant got its name from Raffaele Esposito, considered to be the father of modern pizza. He invented the Pizza Margherita in honor of Queen Margherita of Savoy. Agnello, or Grilled Lamb Ribs, is one of the dishes we had that evening. The lamb was so tender and was perfectly flavored. Read more about our experience in our separate article Raffaele Woodfired Pizza at The Bayleaf Intramuros. After our dinner, we went up to the Sky Deck View Bar, located at the topmost floor of the hotel, to check out the famous 360 degrees, unobstructed view of the entire city. 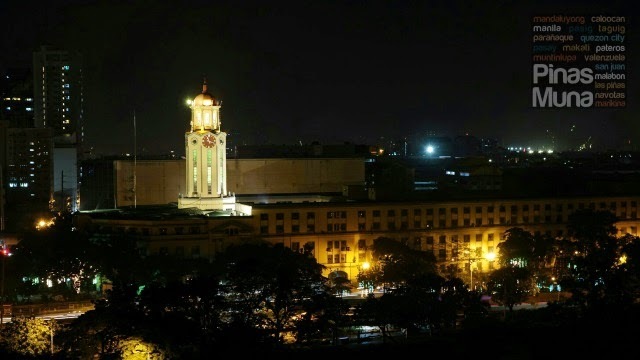 Dominating the evening cityscape is the clocktower of the Manila City Hall. 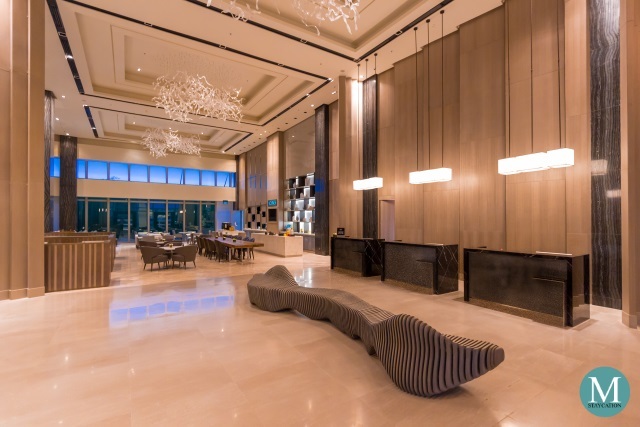 It's also a great place to unwind with some of the best brands of wines and beers, or your favorite cocktail paired with tapas or a selection of bar chows. After a warm shower, it was bed time at 10:00pm. We turned off most of the lights inside the room and left the curtains open. Having a view of Manila right from your window is truly priceless. We woke up at 6:00am feeling well rested and rejuvenated. It was a cloudy morning, and the drizzle outside made us want to stay a little longer in bed. We did a little channel surfing and by 7:00am we decided that it's finally time for breakfast. 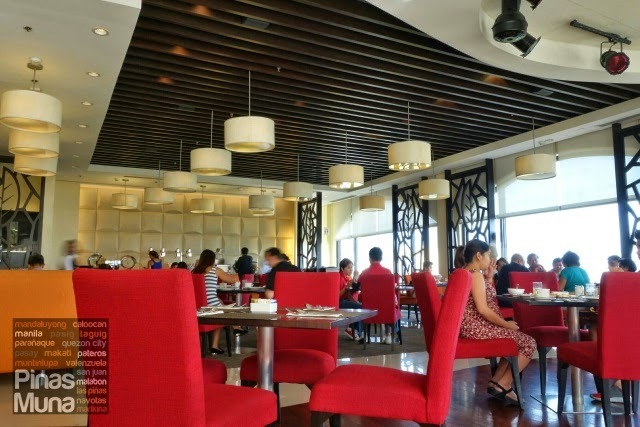 Our room accommodation includes buffet breakfast for two which is served at 9 Spoons, the hotel's penthouse restaurant where guests can enjoy casual dining with a view of the Manila skyline and Intramuros. 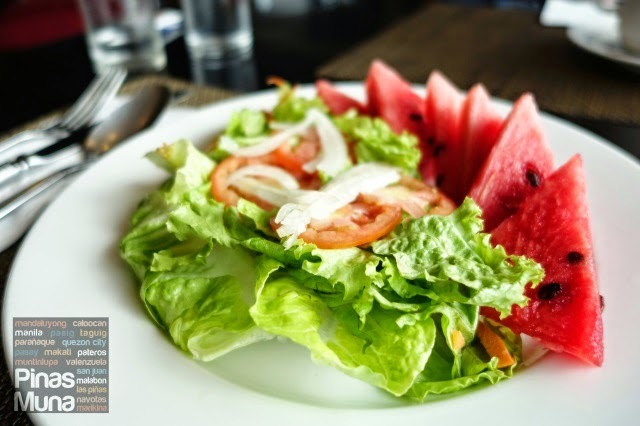 We started our breakfast with salad and fresh fruits with coffee on the side, followed by freshly baked breads, pastries and jams. 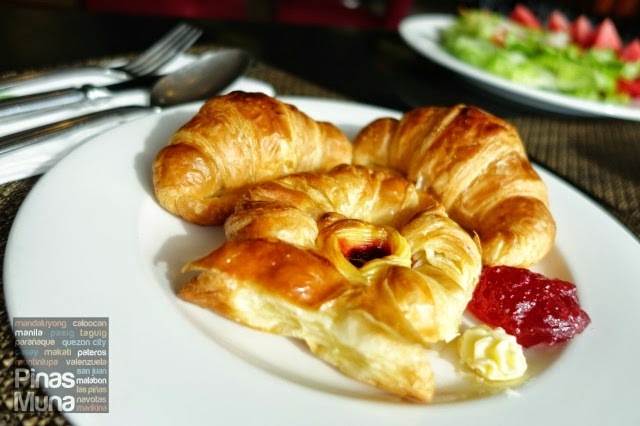 Their croissants are really good, buttery, flaky and soft. Cereals are also available. Various Filipino hot dishes are also available. 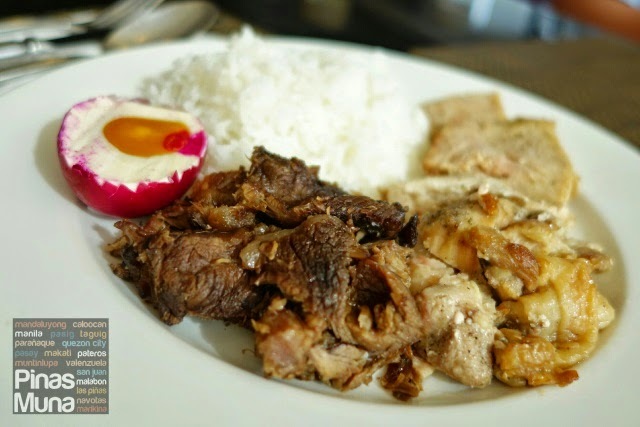 We had the beef tapa, roasted chicken, local meatloaf and salted egg. There's also a section where you can have a customized omelet made to your preference. To maintain a casual dining experience, guests are requested to observe a smart casual dress code at 9 Spoons. Shorts and sandals are allowed, while sleeveless shirts are only allowed for women. As a general rule, wear something that you would consider presentable when receiving important guests at your house. Before going back to our room, we went up again to Sky Deck View Bar to have a daytime view of Manila. On the east side of the building, you will have a clear view of Manila with the sky scrapers of Ortigas and Makati on the background. 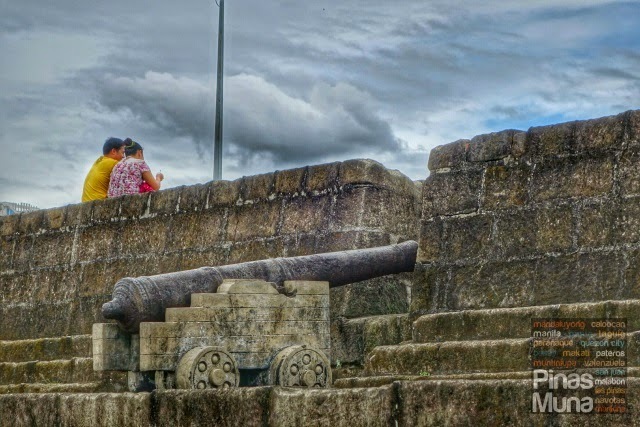 On the west side, you will have a view of Intramuros with the Port of Manila and Manila Bay at the back ground. 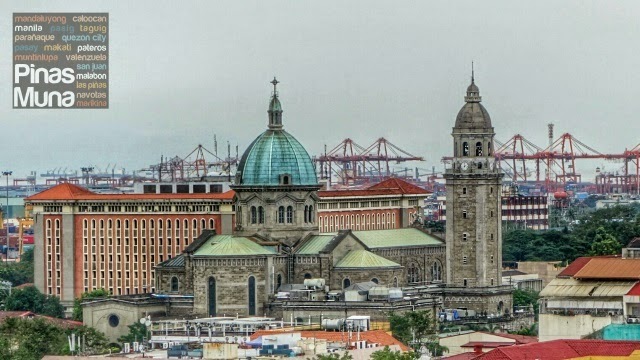 From here, you can also get a different perspective of the Manila Cathedral. 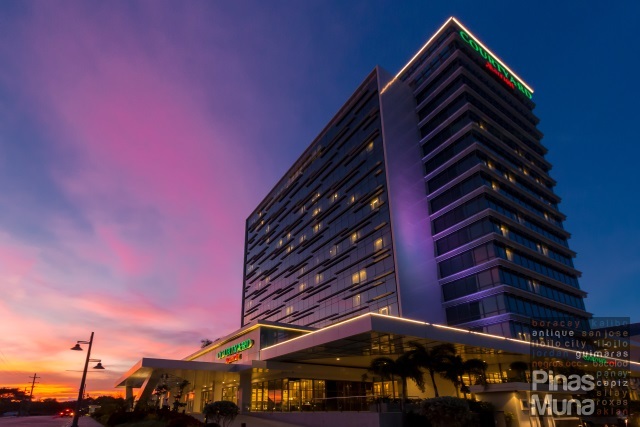 The Sky Deck is also the best place to catch the famous Manila Bay Sunset. 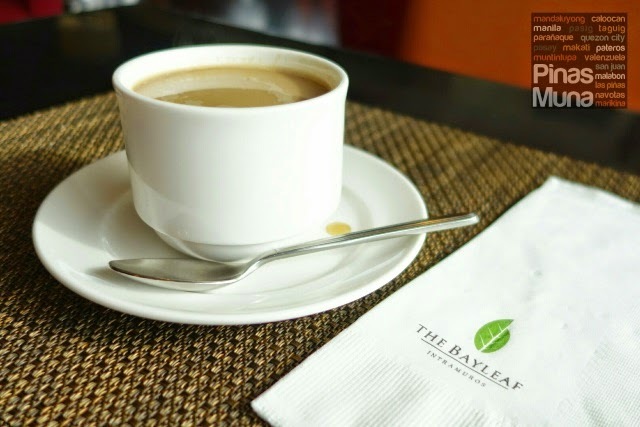 We went back to our room at around 9:00am with enough time to relax in our bed and enjoy the remaining hours of our weekend staycation at The Bayleaf before we check-out at 12:00 noon. It was indeed a lovely weekend spent at the Bayleaf Intramuros. We are very thankful for the much needed relaxation in the metro. We'll definitely be back to catch the Manila Bay Sunset at the Sky Deck. 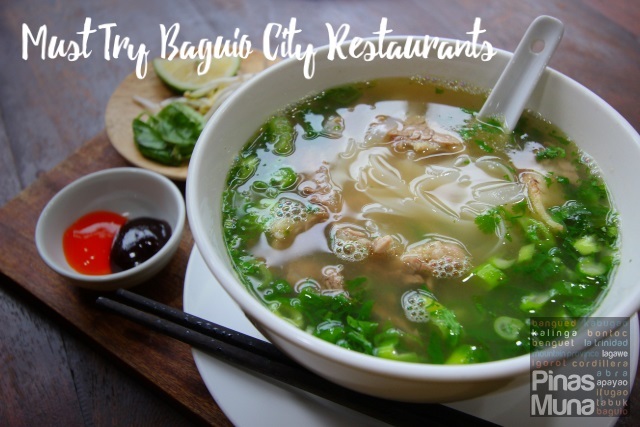 During or after your stay at The Bayleaf Intramuros, some of the nearby attractions that you can visit include the San Agustin Church, the Manila Cathedral, Fort Santiago, Bahay Tsinoy, the National Museum, Rizal Park, Binondo Church, and China Town.